- The daughter of Jupiter and Latona, Diana, was known as the Roman god of hunting and the goddess of the moon. - associated with wild animals and the forests they lived in. - Oak groves were really special and sacred to her. - She was renowned widely for her strength, athletic grace and ability, beauty, and hunting skills. - She is known as a symbol of imagination, thought, sensibility, and creative insanity of many poets and artists. 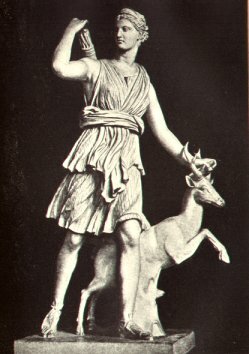 - Worshipped in a temple on Aventine Hill, Diana was made the god of a present-day religion called Dianic Wicca. - In Roman mythology though, she is equivalent of the Greek Artemis. Source: "Diana Goddess of the Moon nad Hunting." 20 May 2008 <http://www.crystalinks.com/diana.html>.